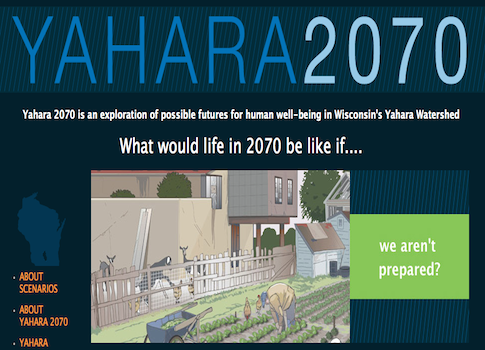 A screenshot of the Yahara 2070 website by the University of Wisconsin-Madison. The National Science Foundation (NSF) gave nearly $5 million to the University of Wisconsin-Madison to create scenarios based on America’s actions on climate change, including a utopian future where everyone rides a bike and courts forcibly take property from the wealthy. The government has awarded $4,911,961 for the project, which is slated to run until March 2016 and for which the school has created a website suggesting different possibilities of what Yahara, a Wisconsin watershed, will be like in 2070. In the scenario where Americans "shift our values," people live in hippie-like communes after "youth culture" convinces the world to give up their cars and eat vegetarian. "By the 2020s, the world seemed at the edge of environmental and political collapse," the scenario says. "Despite this predicament, youth culture becomes empowered to shift the course of humanity. Disenchanted with the country’s highly consumptive culture, the younger generations embrace community building and sustainability and work together through grassroots action to get their voices heard." The youth bring about the "Great Transition" in the 2040s, establishing a "new normal" where "connectivity, community, and environmental sustainability pervade policy and cultural decisions." The protagonist of the story is Rosa, a "community organizer" for a United Nations youth group "Badgers for Our Future," who presides over the only holiday celebrated in the community, Earth Day. "It has become custom for Rosa, the unofficial community matriarch, to give a blessing before the Earth Day meal (although not everyone in the community is religious, they say secular blessings before important community meals to express gratitude for what the Earth provided them)," the story says. The community shares economic resources, as well as goods and services, such as "vehicles, appliances, equipment, meals, and expertise." Material wealth is criticized, and the community lives by the slogan "rich in time; sufficient in things." "Material wealth is not the coefficient of life quality," the story says. "As such, consumers, overall, consume less." "What individuals don’t share with their communities is purchased primarily out of need." Rosa celebrates a court decision that forcibly took property from wealthy individuals as a required step to place the community above the individual. "Even though most Yaharans had become more willing to undertake serious conservation measures, the willingness was not universal, especially when certain sacrifices were required," she tells her granddaughter in the story. "To create the preserve, Grandpa had to convince several wealthy residents to give up either some of their property or their control of it." When some individuals refused, a coalition took them to court, which unanimously ruled in favor of building a community beach. "It was a glorious victory!" Rosa says. "Oh, how we celebrated! It symbolized how far we’d come in putting the good of our communities and our environment before the desires of the individual. The triumph was proof the Great Transition had arrived." "I’d say my community embodies the ideals of the Great Transition," Rosa says in an animated video. "Like many communities in Yahara, we’ve joined our backyards together into one communal space. We have a small urban farm, a restored prairie, and a community gathering space." Citizens of Yahara are "much less reliant on cars," the only ones left on the roads being hybrids or electric, and the roads are full of bike lanes to "accommodate the growing masses of bike commuters." "Since more people are living the pedestrian life, with their feet more frequently on the pavement or the pedal, the obesity rate is shrinking," the story says. People are glad to pay higher taxes in this future because of an "increased sense of responsibility toward one’s community." Campaign finance reform has also brought "increased transparency and public participation in decision making." The American diet is "now primarily plant-based" after "widespread public concern over the climate footprint of livestock banished meat as a dietary centerpiece." Policy changes such as a mandatory living wage for farm workers have "caused food prices to rise," though the public is "largely unfazed," the story says. The UN youth movement helped usher in this "new world order," where population growth has declined, use of fossil fuels has largely been deserted in favor or wind and solar, and a cross-country train system has replaced air fare that has become too expensive. "In the United States, as family sizes decreased, the conceptual boundaries of ‘family’ expanded to include neighbors and friends," the story says. Americans now engage in the "pursuit of sustainable happiness," by adopting a global Gross National Happiness (GNH) index as "its official gauge of prosperity," replacing GDP. The index is based on a system from the country of Bhutan, and takes into account "good governance" and "environmental conservation." However, pockets of "traditionalists" still threaten the "winds of great change." The so-called traditionalists have "been slower to accept or adopt the newer norms, feel society has not necessarily gotten better with the Transition, since certain conveniences and privacies have disappeared." A small group of elderly people also "occasionally complain" that the community "constrains individual privacy, but with the widespread embrace of space sharing and walkability, such complaints are considered deviant." Rosa acknowledges that the community is "certainly no utopia." "Although economic equality has improved as a result of these changes, poverty still exists, and many people still rely on entitlement programs," the story adds. The University of Wisconsin-Madison project is similar to the $5.6 million the NSF awarded to Columbia University to record "voicemails from the future" that paint a picture of an earth destroyed due to climate change. This entry was posted in Issues and tagged Climate Change, Government Waste. Bookmark the permalink.